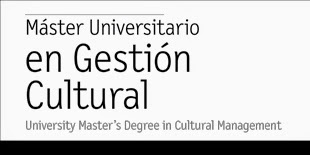 Máster Universitario en Gestión Cultural - UIC - MA in Arts and Cultural Management: Our student Natalia Rojas: "This Master is a nice chance to study the culture from all its possible perspectives". Our student Natalia Rojas: "This Master is a nice chance to study the culture from all its possible perspectives". On April 23rd Barcelona celebrates the day of Sant Jordi, the patron saint of the city where as every year, roses and books have their deserved prominence in the streets of the capital. It is good to remember that in 1996, UNESCO declared this day as International Day of the Book and Copyright, in order to coincide with the birth or death of important authors in world literature, including Miguel Cervantes, William Shakespeare Josep Pla. 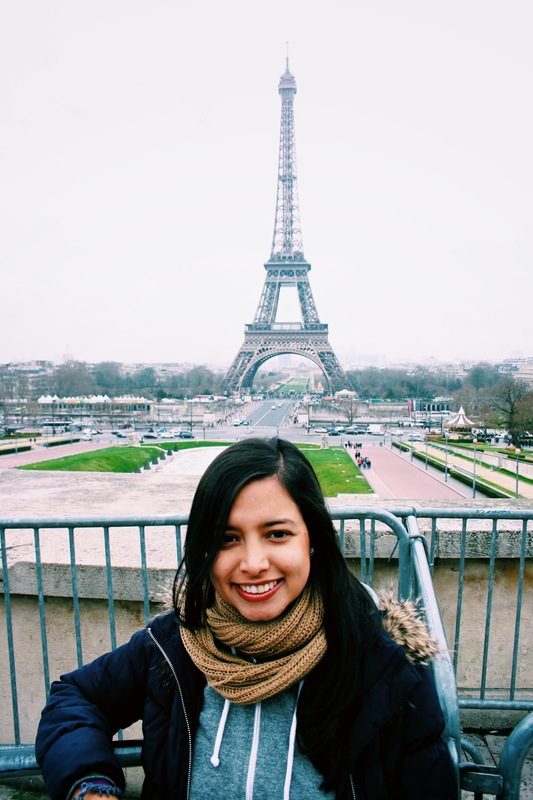 On this occasion we introduce you to one of our students of the MA in Arts and Cultural Management, Natalia Rojas Telléz, from Colombia, who is currently conducting a training internship at GEDISA, a Publishing House specialized in books of essays and thought. Question. Natalia in your country you got a bachelor degree in Social Communication and Journalism at Universidad de La Sabana, and in September of 2014 you decided to pursue the MA in Arts and Cultural Management at the Universitat Internacional de Catalunya (UIC) in Barcelona. Could you tell us how you made the decision? and what was your previous experience in the field of arts and cultural management? Reply. My experience in the field of culture and arts comes mainly from the journalism. During my job as a cultural journalist I had the opportunity to get to know better the cultural industry of Colombia and I felt in love with it. Every single day I had to research and create lots of audiovisual and written content of new films, exhibitions, theater, music, dancing, literature or gastronomy. Another important factor for my decision was my studies in filmmaking and scriptwriting which took place in both Bogotá and Austin - at the University of Texas. The Journalism profession has a full range of transversal competences, skills and attitudes that are relevant for the arts and culture field. That is why I decided to come to Barcelona to pursue this master’s degree, and also because I think this is going to be the perfect complement for my academic and professional background. Q. Natalia, every year on April 23rd is a very important date for Barcelona, not only for the celebration of the feast of its patron and protector, Sant Jordi, but also because this day, books and roses are the main stars of the city and is a day of great significance for the publishing sector. Can you tell us how Gedisa Publishing House is preparing the celebration of this day? R. Well, it is important to take into account that for Sant Jordi, people normally buy and give literature and fiction books; however, Gedisa is a publishing house specialized in essay and non-fiction books. Nonetheless, at Gedisa's we’ve been preparing for Sant Jordi from at least three months ago. The preparation has to do with the communication and promotion of our two main novelties: First of all, Hic et nunc a book about the latin expressions that we still use in different languages. 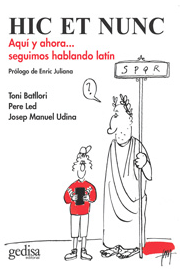 The author is Josep Manuel Udina and it has drawings by Toni Batllori and Pere Led. 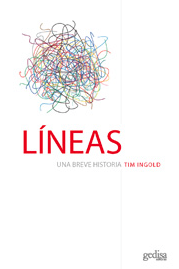 The second main book for this celebration is Lines by Tim Ingold, a really interesting text about the importance of a line in every single detail of our lives. The promotion behind any book includes social media, press, videos, mailings, newsletters, interviews with the authors and visits of the authors to Barcelona, among others. 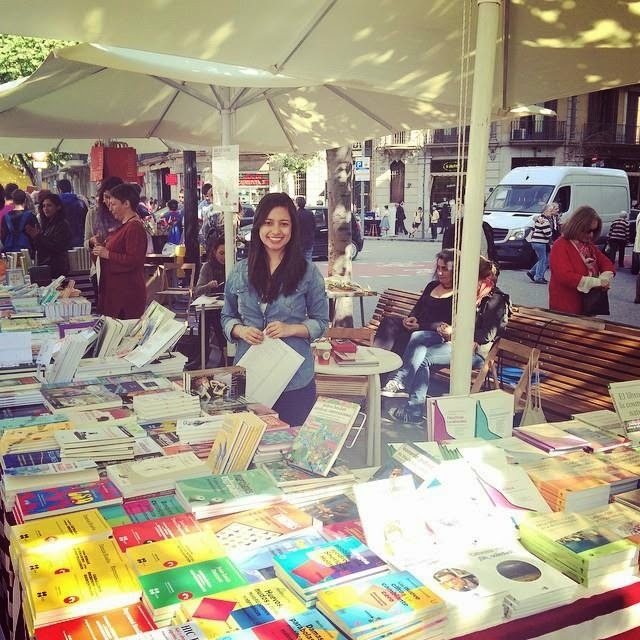 For Sant Jordi we will arrange a table with books near Plaza Catalunya with Provença. Toni Batllori and Pere Led (the cartoonists of Hic et nunc) will be signing autographs in different bookshops of Barcelona. Q. Gedisa was founded in Barcelona in 1977 by Victor Landman, and today nearly four decades later; it has an extraordinary catalog of books on essays with a high prestige. How did you get the opportunity of making your university internship at this publishing house and what are your daily tasks? R. I saw the offer that the UIC sent to all of the students of both master’s degrees, then Consuela Dobrescu -the Master’s Coordinator- told me a bit more about it. I’m really thankful to Consuela because she helped me a lot with it. After some time they called me, I had an interview and then I got the internship. The first thing that I do in the mornings is media monitoring and I always have something new to research about. But every day is different; I do a lot of things at Gedisa. I make videos, do translations, write e-mails, I help the team with advertising campaigns for several universities throughout Spain and also take part on the preparation of different big events like the visits of our authors when they come to Spain. Q. Natalia, how do you apply your academic and professional experience at this publishing house with the knowledge acquired in the MA in Arts and Cultural Management at UIC? R. One of my favorite subjects of this MA has been “Legal Aspects” and it’s funny because even though I have nothing to do with the rights department of Gedisa, we must take particular care to the copyright of every book, of the images, and the translation, among some other things. So it is good to have the knowledge and apply it to the real life. In addition, my experience as journalist and the knowledge acquired in some other subjects like Cultural Marketing, have been very important to develop the daily tasks. Q. For the academic year 2014/2015 the students of the MA in Arts and Cultural Management of the UIC come from twenty-four different countries. Natalia you came from Colombia and therefore we want to know what differences you perceive between the cultural activity and management of a city like Bogotá and Barcelona? R. Bogotá is a city where most of the cultural activities or places are focused on the locals, while in Barcelona they are made not only for locals but also for tourists. The cultural industry in Bogotá is getting stronger while in Barcelona the industry is firmly established; Barcelona is a city with a charm of its own, there are more museums, more attractions, there is the modern architecture, it is a Mediterranean city which makes of it a completely touristic place. The differences are huge, Bogotá is not that touristic. Another big difference is that the Colombian government is going through a peace process trying to end more than fifty years of armed conflict. Therefore, some of our cultural policies or initiatives have the need to find the proper reconciliation with the victims or with the purpose of reintegrating ex-combatants back to the society. So it is very common to hear about a concert for the peace, a theater play for the peace and different activities around the well-known ‘culture of peace’. Q. You've been living in Barcelona since September 2014. Could you share with us any experiences you've lived in this city and in the MA in Arts and Cultural Management? R. Just the fact of living in Barcelona is a whole experience, but there are wonderful towns in Catalonia that have been a good experience as well. Last year I went with some friends to Figueres, Cadaqués and Port Lligat. In Figueres we visited the Teatro-Museo de Salvador Dalí and in Port Lligat we went to Dali’s beach house. It was an unforgettable trip. No one should leave Barcelona without going to these beautiful places. Then, a few months later at the UIC we had a special lecture with Joan Manuel Sevillano Campalans, the Manager of the Gala-Salvador Dalí Foundation and it was fantastic the way he complemented those vacations with useful information about the managing of Dali’s brand. It has been one of the best lectures of the master’s degree. gives a master class to students from the Master’s Degree in Arts and Cultural Management. Q. And finally, we want to make a double question. What book do you recommend us for this Sant Jordi 2015? And second, what advice would you give to those who are assessing to start next year the MA in Cultural Management at UIC Barcelona? R. Every time that I go to a new city I like to know more about it, not only visiting different places but also through its literature. So I’ve been into Barcelona’s literature and I recommend two books: The Time of the Doves by Mercè Rodoreda, a beautiful little novel that apparently everyone reads in Barcelona during high school. The second one is Cathedral of the Sea by Ildefonso Falcones which is about Santa María del Mar. I also wanted to get to know better the contemporary Spanish literature, and thanks to a friend I discovered Arturo Pérez- Reverte who writes amazing books and columns; so far I have read El capitán Alatriste and I had lots of fun. And last but not least, as a journalist I widely recommend the Communication Collection of Gedisa, they have really interesting and updated books about new digital media; if I had time I would read them all! For those who are assessing to study the MA in Cultural Management at UIC next year, I would tell them that the program not only has the romantic part of arts and culture, the master is entirely dedicated to the business area as well. It is crucial that they come prepared for subjects related to rights, lots of numbers, formulas, balance sheets, knowledge in economy and even in politics. They will study the culture from all its possible perspectives. I would also advise them to start thinking about a cultural project, required by the UIC previously because it is something serious and they don’t want to come out with a vague idea a few weeks before the first presentation and they don’t want either to change their idea along the course, that could be very exhausting. It helps to keep in mind that this cultural project might be real or your future job.